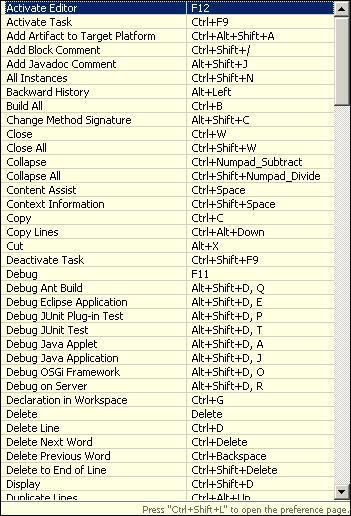 I use Eclipse IDE already for more than 6 years and of course, I won’t use many shortcut keys for my usage but we should also aware what are the hot keys of Eclipse IDE. Ctrl+Shift+L to get a nice list of all the hotkeys, so you might need to remember only this one. Ctrl+F6 — Switch between last used files -> change it to alt+q !!! Ctrl+Space — Context Assist: press after a ., or to use macros (for, while, sysout, …). Press in class-scope to automatically create method declarations. Alt+BackArrow and Alt+ForwardArrow — This toggles you back and forth to the files you last had open. Is nice when I’m drilling down thru code and then coming back up again. Ctrl-2 — has some nice keystrokes available for the Source menu, like ctrl-2, L for create local variable. Alt-F3 — which takes you to the _implementation_ of the item under the cursor. So instead of taking you to List.add(), it would offer you the choice of ArrayList.add() and LinkedList.add(). If there’s only one choice, it jumps straight to it.